Militarization of Armenia is not a new development since it became a vital agenda for the country from the independence, said Mehmet Fatih Oztarsu, analyst at the Turkish Strategic Outlook analytical center. Oztarsu made the remark as he commented on news that the Armenian side has approved the deal with Russia on weapons supply to Armenia through a $200 million deal. The Armenian government approved the first $100 million loan package, which will be extended to Armenia for 20 years. “It is obvious that Armenia needs to have more weapon to remain as so-called “powerful” country according to their leadership. But this is just for consolidating the domestic stability and saving the regime power,” Oztarsu said. The expert went on to say that the Armenian side is following the way of provocation and aggression. “We see their wrong policy when it comes to the Nagorno-Karabakh conflict. Using these weapons in the contact line is obvious,” he said, adding that unfortunately, Armenia will keep the same way until the regime powers change. Emphasizing that so far the political discussion, talks and meetings between Armenia and Azerbaijan were not fruitful, Oztarsu said that Yerevan’s main policy is to show Azerbaijan as the aggressor side. “This mind should change and everything should rely on mutual trust,” he said, noting that Azerbaijan also should be careful for new provocations by Armenia. Azerbaijan and Armenia for over two decades have been locked in a conflict, which emerged over Armenia’s territorial claims to Azerbaijan. 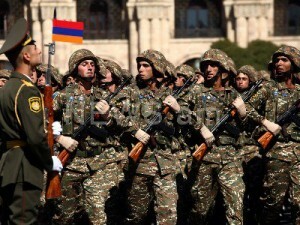 Since the 1990s war, Armenian armed forces have occupied over 20 percent of Azerbaijan’s internationally recognized territory, including Nagorno-Karabakh and seven adjacent regions. Although the UN Security Council has adopted four resolutions on Armenian withdrawal from the occupied lands of Azerbaijan, they have not been enforced to this day.